Aft-View Extented Balcony Stateroom Take pleasure in the view and comfort in the space. Plenty of room, comfortable beds, lots of room in bathroom for toiletries. Love the wake view. Loved the steward. Plenty of storage. Large cabin. Balcony larger than regular balcony. No privacy however so if this is important do not book this cabin. 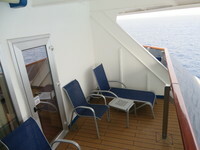 I wanted to try an Aft balcony but would not do so again, to far to walk to many things on the ship.